What should I expect from my deep plane facelift surgery? As the name implies, a deep plane facelift goes further beneath the surface to lift underlying tissues that give structure to the “planes” of your face. 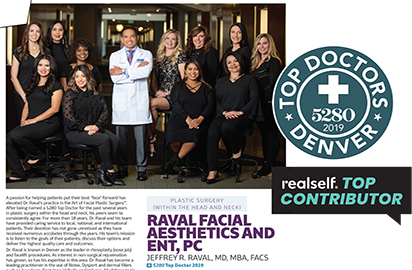 This procedure addresses more of the mid-face and cheek areas than other facelift options, so Dr. Jeffrey Raval, MD, MBA, FACS generally recommends it instead of a traditional SMAS facelift. However, he can also use deep plane techniques with a mini-lift. The bottom line? Patients can expect better results from a deep plane facelift. How does a deep plane facelift differ? It’s easy to look in the mirror and see how gravity and exposure to sun change our face over time. Wrinkles, folds, and dark spots on the surface. Loss of fat that results in hollow cheeks and sagging skin on our forehead, jawline, and/or neck. But what we cannot see is the changes that occur deeper within to the muscles and tissues that support our facial features. A mini-lift is designed to help younger adults (30s and 40s) maintain a smooth jawline. 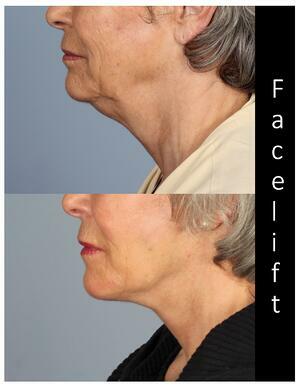 A neck lift specifically addresses sagging and wrinkling in that area. An SMAS facelift provides more obvious traditional lift to the lower third of the face for those in their 50s or 60s. It addresses issues further below the surface than a mini-lift or a neck-lift, but a deep plane facelift goes to the heart of the matter, tightening the deepest structural elements that lie beneath the SMAS layer. As you might guess, it takes exceptional surgical skill to successfully perform a deep plane facelift. As with all facelift options, the deep plane surgery is an outpatient procedure performed at an accredited surgical center. You will arrive and go home the same day. For the surgery, Dr. Raval uses either general anesthesia or local anesthesia combined with deep sedation. And despite the deeper work, the procedure takes about the same amount of time as an SMAS facelift. Hmmmm. In a recent blog “what is a deep plane facelift” we said there is LESS post-surgery swelling and bruising than with other procedures, but a LONGER recovery time (10 days-2 weeks). However in another recent blog (“when is deep plane the best option?”), we said there is NO MORE DOWNTIME for this procedure but patients can expect swelling to last LONGER. These assertions seem to contradict one another, so what should we be telling people? Natural looking results are so important! You want to look vibrant and healthy, not dramatically different. That’s always Dr. Raval’s top priority, too. Using the deep plane technique, he can help patients achieve a more youthful appearance that will last longer. Patients typically look 10 to 15 years younger. Over time, your face will continue to age naturally, of course. But you will still continue to look that much younger than your actual age. Dr. Raval always makes the smallest incisions possible. Once you have recovered, the scars will not be visible because they’ll be hidden in your hairline. People may well comment on how great you look – have you been on vacation? But they’ll never know you had a facelift unless you tell them. We always like to say, “Your results may vary.” That’s because every patient is different. So, as always, the best way to learn what you might expect from a deep plane facelift is to schedule a personal consultation with Dr. Raval.